Aging adults with a decreasing sense of balance are at risk for falls that lead to serious injuries. However, you can use the following strategies to help your senior loved one overcome challenges posed by balance issues. Balance issues are sometimes temporarily caused by another health condition. For example, your loved one may have fluid in the ear from an infection. Clearing up the infection could naturally restore his or her balance. Vision issues, medication side effects, and stiff joints are a few treatable issues that may be affecting your parent’s ability to balance. When your loved one experiences balance issues for the first time, schedule an appointment with his or her doctor to look for the underlying cause. Seniors can face a variety of challenges as they age, many of which can be mitigated with the help of professional in-home caregivers who provide high-quality home care. Victoria families trust Home Care Assistance to help their elderly loved ones age in place safely and comfortably. Certain chronic health issues also generate balance difficulties. For instance, uncontrolled diabetes leads to fluctuations in blood sugar levels that are known to generate dizziness. Seniors with Parkinson’s may lose their balance if their muscles stiffen up unexpectedly. If your loved one has a chronic health condition, find out how it could affect balance, then set up a treatment plan that includes assistance with medication management and transportation services to the doctor. Living with a serious health condition can make it challenging for seniors to age in place. However, they can maintain a higher quality of life with the help of professional live-in care. Victoria seniors can benefit from assistance with meal prep, bathing, transportation to the doctor’s office, medication reminders, and much more. Muscle mass is slowly lost over time as a normal part of the aging process. As the core muscles start to decrease, your loved one may lose his or her sense of balance as well. Fortunately, there are exercises your parent can do to strengthen these muscles. For instance, leg lifts from a seated or standing position challenge the abdominal and lower back muscles. Your parent can also use a chair or the assistance of a caregiver to practice muscle strengthening movements such as stepping in place and standing on one leg. When your loved one has ongoing balance issues, one of your primary goals is to prevent injury. Provide mobility devices and assistance with tasks that tend to cause a loss of balance. From adding handrails to the bathroom walls to helping with housekeeping tasks such as mopping, providing physical and emotional support prevents your parent from doing a task alone that could cause a fall. 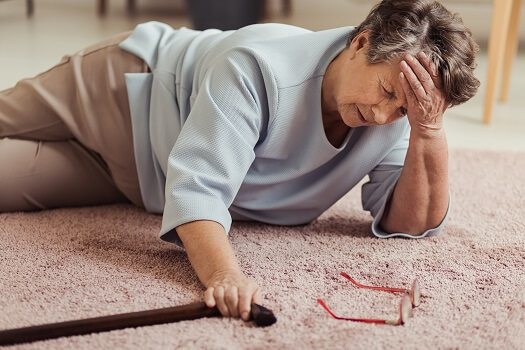 Seniors sometimes stop doing things for themselves out of the fear that unsteadiness will lead to a fall-related injury. However, your loved one needs to continue to use his or her body to retain balance abilities. If your parent seems to be nervous about performing tasks such as getting out of bed independently, offer to arrange for a caregiver to stay nearby. Older adults with balance issues can benefit from professional in-home care. Victoria elder care experts are available to provide high-quality care to seniors on an as-needed basis. From assistance with mobility and exercise to providing transportation to the doctor’s office and social events, there are a variety of ways professional caregivers can help your aging loved one continue to live independently. Call Home Care Assistance at (250) 592-4881 to create a comprehensive in-home care plan for your aging parent.